Few purchases are as emotional — in a good way — as jewelry! About 15% of those buying Valentine's Day gifts plan to purchase jewelry, according to a recent survey. 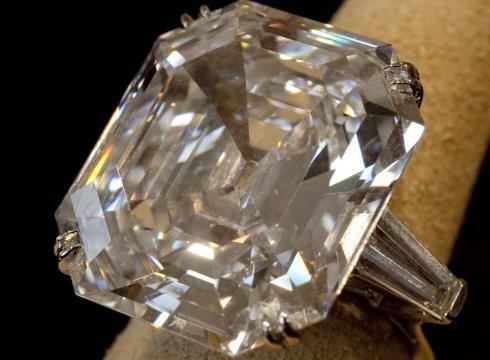 This 33.19-carat diamond ring given to Elizabeth Taylor by actor Richard Burton sold for over $8.8 million at auction in New York last year. About 4 million people are expected to get engaged thisValentine's Day, and 15% of those buying Valentine's Day gifts plan to purchase jewelry, according to an American Express survey of 2,000 people out Monday. There have never been more places to buy fine jewelry, but buying from someone you trust is important. The Jewelers Vigilance Committee, a legal compliance group founded in 1917, monitors the sale of precious metals and stones and has found the karat weight of gold often misrepresented by low-priced "jewelry exchanges." Many consumers feel more comfortable with a jeweler they know, but "many major retailers and department stores are very proactive in terms of quality control," says Cecilia Gardner, the committee's CEO. Shoppers also may need to be a bit pushy to find out whether the salesperson in a chain store is knowledgeable and should check the chain's websites for details about the quality of the fine jewelry it sells. Still, look elsewhere if a jewelry salesperson refuses to answer questions, Gardner says. There are plenty of good deals online; you just need to insist on the same level of detail about what you are buying. The quality of a diamond is described by something known as the four C's: cut, clarity, color and carat weight. "There is no cheap way of getting good stones unless a relative has a diamond or a friend is getting divorced," says Russell Shor, senior analyst with the non-profit Gemological Institute of America. So the biggest considerations should be price, quality and ethics, if that sort of thing matters to you. •Price. The red flags to watch out for when shopping for gemstones include "wholesale to the public" promotions, suggestions that jewelry will appraise for far more than the price, and deep discounts, which usually only mean the quality has been slashed, experts say. It's actually illegal to promote wholesale prices to retail consumers. When it comes to diamonds, people too often get fixated on certain size stones. A diamond that is slightly less than a half-carat — a difference that would be almost impossible for the average person to see — can cost far less than a half-carat stone, Shor says. •Quality. The cut of the diamond is one area that shouldn't be compromised. It gives diamonds "all of the life and the sparkle you see," Shor says. Diamonds and other precious stones — rubies, emeralds and sapphires — are often treated to enhance their appearance. That's something that needs to be disclosed. "Inclusions" are imperfections that are sometimes only visible with a jeweler's magnifying loupe. But a diamond with the highest level of inclusions would only be sold in the kinds of places that claim to "cut out the middleman" and would look "like it has a road map in the middle of it," Shor says. •Ethics. Precious stones can be used to fund civil wars or support dictators. Concerned consumers should ask jewelers for evidence their suppliers use diamonds only from legitimate sources, Shor says. Beth Gerstein, co-owner of San Francisco-based jeweler Brilliant Earth, specializes in "ethical" stones. She says many other jewelers don't trace where goods come from because "they don't think consumers care about these things." Of course, there's far more to jewelry than the quality of the stones, silver, gold or platinum. Robindira Unsworth, who sells jewelry online and at a Sonoma, Calif., boutique bearing her name, recommends making sure closures are secure and products don't seem "rickety." Beyond that, "You have to go with what you really love," Unsworth says. And what you can afford.